Frank Mandt died after a fall down his basement steps, the same basement that holds a locked safe bolted to the floor. His granddaughter, Sofie Lund, inherits the house but wants nothing to do with his money. She believes the old man let her mother die in jail and is bitterly resentful. Wisting’s journalist instinct leads her into friendship with Sofie, and is with her when the safe is opened. What they discover unlocks another case and leads Chief Inspector William Wisting on a trail of murder and narcotics to an ordeal that will eventually separate the innocent from the damned. The Nordic Noir genre has brought a sense of realism to the crime fiction world that I have high regard for, with its appreciation for the daily grind behind so much of police work and its wider social and political commentary. 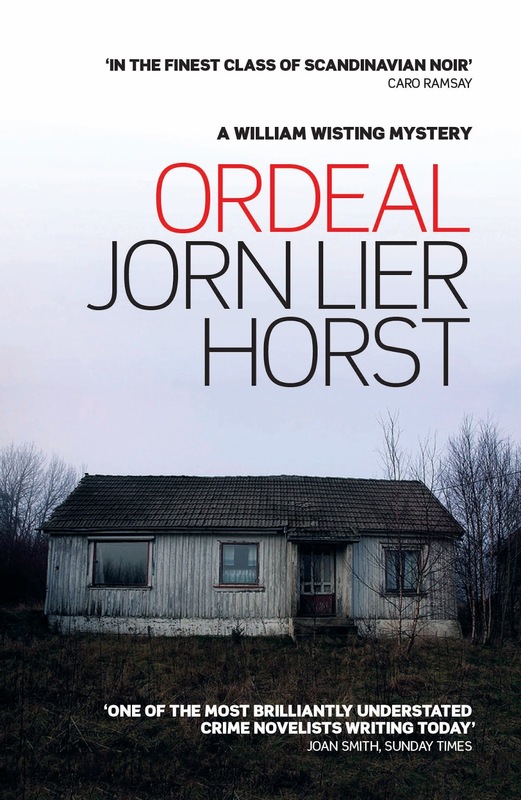 In Ordeal, Lier Horst brings a tale of everyday life in a neighbourhood which is reassuringly ordinary and chimes with readers. 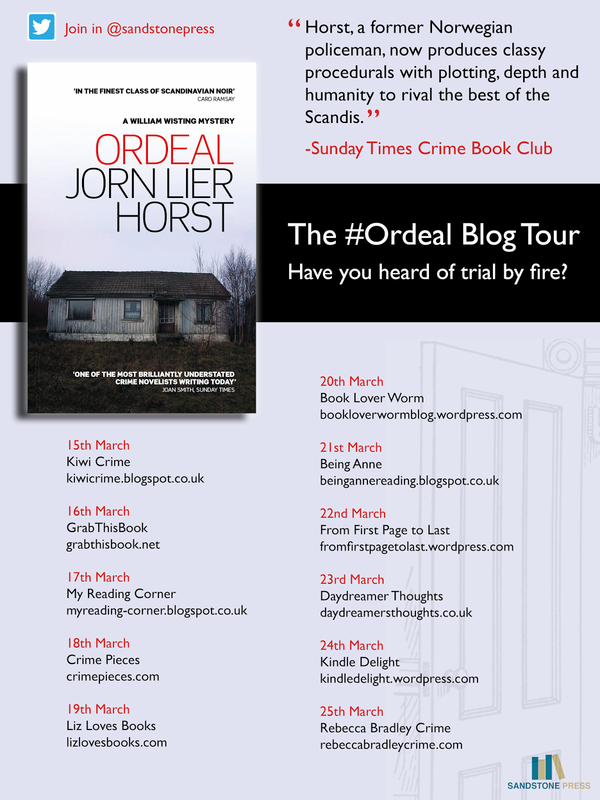 Combining the rigour and stringency of a police procedural with humane investigators, Ordeal exposes the darker element of an ever changing society and Wisting understands that both people, including police personal, and procedures can be fatally flawed. Ordeal is the fifth of the William Wisting novels to be translated into English and sees Wisting aged fifty-five, a widowed man, father to two adult twins and soon to become a grandfather. Wisting is an upstanding and earnest policeman and along with high standards for his work he makes time for his family and colleagues and has risen through the ranks to become Chief Inspector of CID for Larvik Police. Thankfully free of the neuroses that plague so many of the Nordic Noir crime fighters he has a keen social awareness and a refreshingly normal relationship with both women and alcohol! A career policeman he may be but Wisting is not blinkered to the darker side of human nature and his understanding and acceptance that humans err and his job is evolving constantly is fundamental to the man. Ordeal sees Wisting under fire from his superiors with the six month old disappearance case of taxi driver Jens Hummel remaining unsolved and a thinly veiled newspaper article implying substandard work by the police force has upped the ante. When the taxi, without Hummel, is recovered at an isolated barn things seem no clearer and it is former investigative journalist daughter, Line, who by chance presents Wisting with the first clue. Raising more complications as the case unravels Wisting discovers a web of intrigue which involves a murder case 100 miles away, an imminent trial and a long established narcotics trade in his own home town. When his discoveries threaten to derail a long considered closed case in a neighbouring town, the dissenting voice of the Chief of Police grows increasingly louder as Wisting threatens to make an awful lot of enemies amongst his colleagues in the force. Attempting to keep an eight months pregnant Line out of the equation, Wisting must simultaneously head off a possible miscarriage of justice. William Wisting considers every new piece of information and it is his ability to stand back from the eye of the storm and evaluate is intrinsic to his success and it is patently obvious that Jorn Lier Horst himself has occupied a prominent role in the force. His invaluable insights and emphasis on the interpretation of a crime scene as opposed to simply the physical evidence that it holds is just one of numerous examples. It is these satisfying nuggets of information and his willingness to embrace new investigation methods and technologies that are central to Ordeal. Interestingly in the novel Wisting spends much of his time waiting the outcome of routine tests and the cross-over between what the investigator alone can offer and the less subjective evidence is highlighted brilliantly. Likewise, the delicate balance between the formal police role and the need to present a human face whilst never allowing it to detract from the leadership of the investigation was intelligently made. The meaty sub-plots ensure readers maintain constant engagement with the storyline, from Line’s pregnancy fears to Wisting’s relationship with former girlfriend Suzanne and the overtones which colleague Christine appears to be making. This adds an element of frisson to the proceedings and alongside personal matters, the evolving challenges facing the police force are frequently brought into the light, reduced resources being central to this. Wisting recognises that the attitude of the public to the police force has hardened, people have become more remote from each other and he appreciates the demands that face public prosecutor Christine acting as a go between for the rank and file and the conflicting managers of the force who demand results. Whilst Lier Horst may not bring the gung-ho action packed shoot outs common in so much of crime fiction, he packs an equally powerful punch with his pragmatism, intelligence and understanding of the minutiae which so much of crime fighting relies on. 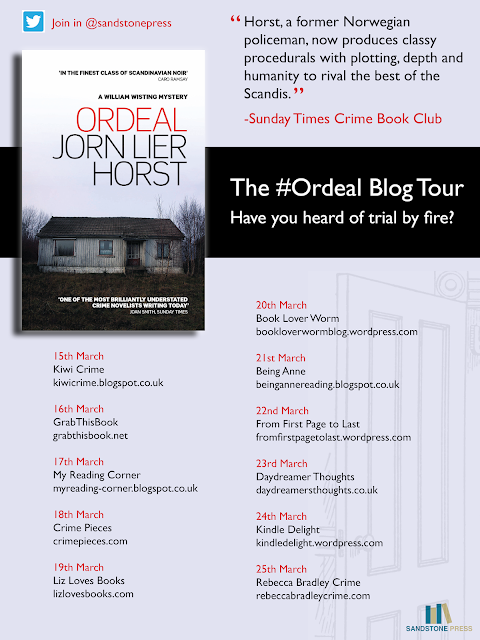 Jorn Lier Horst runs rings around his readers and even the most hardened crime fiction reader won’t see the denouement coming! Prepare to be bamboozled and blindsided… With its subtle social commentary and reflections on how the job has changed Wisting sensitively explored and with a poignant parting shot, Jorn Lier Horst has one final sting in the tail to leave readers with a bittersweet aftertaste. Lier Horst has delivered a masterclass in ingenious plot construction and this is intelligent crime fiction which leaves you pondering.. Simply stunning and highly recommended. The two page précis at the start of the novel introducing readers to the William Wisting character serves wonderfully as a handy guide to his police career and personal life which ensures that Ordeal can be read as a standalone. However, I saw more than enough here to tell me that Lier Horst and the admirable William Wisting will be making a repeat appearance on my reading list. With four novels already published in the series I will have plenty to keep me occupied ahead of the next release. A wonderfully fulfilling novel, with ingenious plotting and an understanding of just what it take to be a successful investigator, this is splendid stuff! 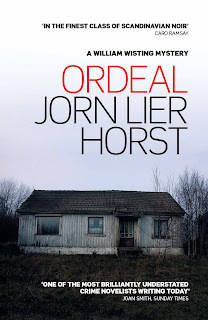 Jorn Lier Horst is the author of the highly successful William Wisting series of crime novels. Blind Door is the fifth to be translated into English after Dregs, Closed for Winter, The Hunting Dogs and The Caveman. Previous books in the series have won the Riverton Prize, the Glass Key, and the Martin Beck Award.